Thank you for choosing Koa Resort for your stay on Maui! Below, you will find a couple of documents that you will need to print, fill out and bring with you to Maui. Please note that there is an office located near the parking lot, but it is not necessary for you to check-in there when you arrive. Each townhome at Koa Resort is privately owned and managed. If you have an issue with, or a question about, something in your unit, please notify MKVR @ 1-877-583-2401. The on-site manager is not responsible for the vacation rental management at Koa Resort and will not be able to answer your questions. However, if you have an emergency that includes a "common element" (i.e. a sudden plumbing leak that requires the water to be shut off immediately), please notify MKVR and the on-site manager. Each car must be registered for parking at Koa Resort. Failure to register your vehicle and use the provided parking passes (located at the unit) will result in a fine and possible towing of your vehicle. Please print the registration form below and fill it out with information that corresponds with your Koa Resort rental unit number(s) and car details. If you are renting multiple units, please print one for each townhome. Mahalo for your Kokua! 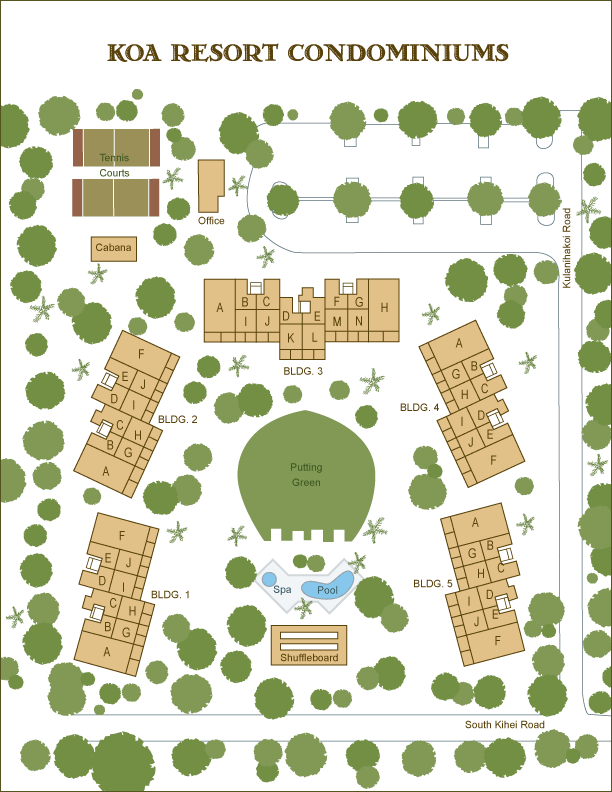 KOA RESORT MAP - This map of the property is provided to help you more easily find your condo when you arrive at the property. PLEASE PRINT AND BRING A COPY WITH YOU. You will go straight to your rental upon arrival and use the lockbox/door code provided in your check-in instructions. KOA RESORT RULES - Each member of your party must read and abide by the Koa Resort Rules. Below is a copy of the complete Koa Resort Rules posted in each unit, as well as a summarized list of rules provided by the Koa Resort Homeowners Association. Failure to follow these rules will result in fines, so it is important that every member of your group reads and understands the property requirements.